Image caption Activists marched with their pets and carried a sign saying "Cuba against animal abuse"
Hundreds of Cubans have held a march against animal cruelty, in what is thought to be the first independent protest allowed in the country. 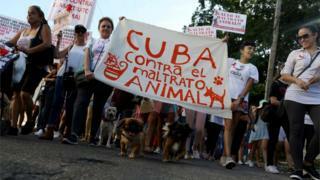 Activists walked with their pets and chanted slogans as they demonstrated peacefully in the capital Havana. They called for an animal protection law as they converged on a tomb of an American woman who is seen as the founder of animal rights in Cuba. The one-party state has until now only allowed government-sanctioned marches. "This march marks the before and after in the protection of animals in Cuba," organiser Beatriz Batista said. "I consider it to be a historic event." Others were more sceptical, with dissident artist Luis Manuel Otero Alcantara telling Reuters news agency it could be a show by the government. "This enables the government to say 'look how permissive we are'," he said. "But is it really?" Activists spread word of the march on social media. In December the Cuban government allowed a rollout of 3G mobile internet, where once people had to rely on internet cafes and wi-fi hotspots. Marches in Cuba had until now been strictly controlled by the government, and were mostly limited to demonstrations celebrating the 1959 revolution or religious processions. Authorities however still refuse to allow protests against the state.